We managed to make a polar trip and now I can die a happy man. These eyes have seen komodo dragons in Komodo Islands, mating of lions in Kenya, safari with huskies, chattering with deers, journey at the frosty sea with the famous icebreaking ship Sampo and I even swimmed in those icy waters. There are no adventures to scare me off anymore. The idea of travelling to Laponia, the place under the snow, came from me and since the northern lights (Aurora Borealis) on the stake, my photography enthusiats husband like it very much. Our teenager weren’t happy about anything lately so he was not excited but when he heard who’s coming with us with their daughter he excited suddenly. When we say “We’re hitting to Laponia,” most of the people asked “What? Where? Japan?” naturally because it’s a region with so little popularity at least in our country. There are only a few people went there from our country but it’s certain that the number will increase. There was another group of people who couldn’t understand what the hell are we going to do there or teasing with us sneakingly. It was one of the unforgettible holidays besides cold weather, troubled arrival and wearing a lot of layers of clothes always. How many people could have a chance to drink from ice glasses, pet the huskies and even go to safari with them, sit next to a deer, ride a deer sled, ride a motorcyle on a frozen lake and sail in the Baltic Sea with an icebreaker ship? Laponia is a region of swamps with plenty of forests, water canals and rivers. This place is Finland, Sweden and Norway’s border to polar line and a heaven of white people. Don’t think about how to go to Laponia to much because it’s easier than your guess. We were the first group that have ever flew to Rovaniemi because normally there are no direct fligths. You must fly to Helsinki, the capital of Finland, first and after that fly to Rovaniemi with a domestic flight and in 4,5 hours total, you reach to the polar circle. Our direct flight would take four hours but because of a little action that happened durign our flight our landin was delayed. Returning flight took three hours and fourty minutes. Interestingly there are no time zone differences. When you go somewhere like this, one thinks like there must be a giant difference. Rovaniemi Airport is known as The Official Airport of Santa Claus so it’s official. Since it’s the official country of Santa, there are parks, deers, Santa Claus figures and masks everywhere in the airport. While we were getting on the bus, we understood that the ice that we walked on when we get off the plane was nothing. Temprature was minus three and even if we didn’t cold, the ground was looking like a bold massive glass. Even the roads ara frozen, no salt application is made, everyone uses snow tires. 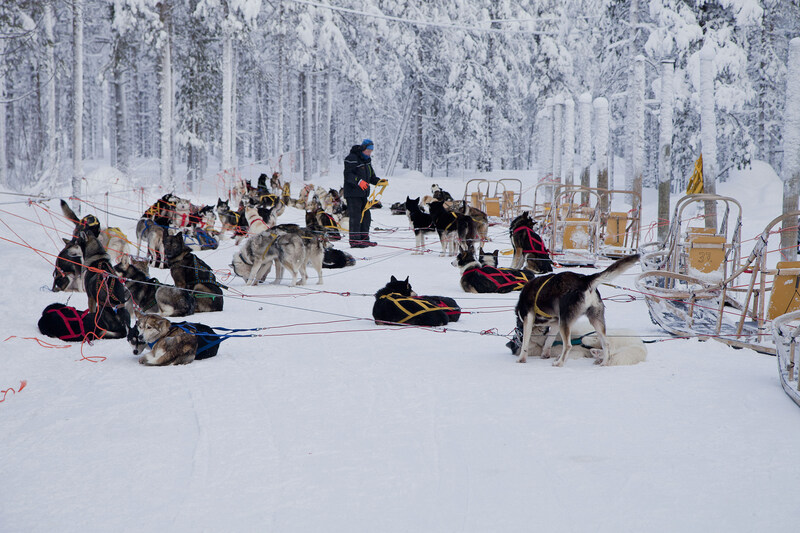 Rovaniemi is located in the 800 kilometers north of Helsinki, the meeting point of Kemijoki and Ounasjoki rivers. A modern city which is a stop for the ones who travel to north, come from south. Our hotel Santa’s Santa Claus is five minutes from Rovaniemi’s main swuare and Ounasjoki river by walk and like it’s name, it’s a four star chrismas hotel around cute bars and restaurants. Since our arrival was a little bit tricky, after we placed our luggage to Santa Claus Hotel in downtown we headed to Arctic Light Hotel which I was very curious about. 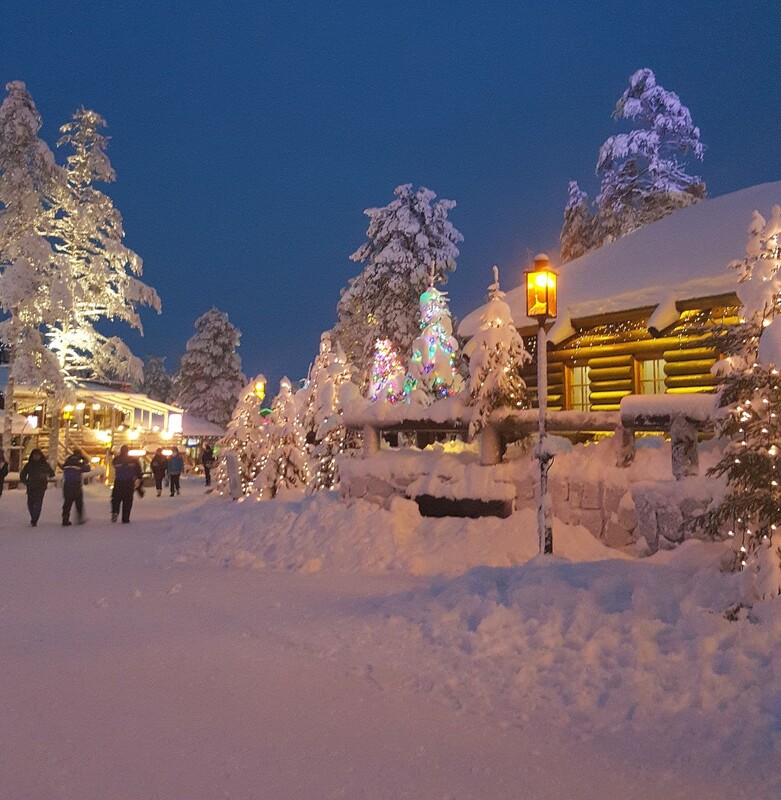 Twenty minutes from Rovaniemi, we arrived a fairy tale like hotel through beautiful houses decorated by snow white trees and star like lights. It’s an ice hotel and restaurand as well as a very suitable place for northern lights since there is no light pollution. I saw an iglo house for the first time in my life. To spend time in this tiny rooms with glass ceilings you better not to have any problem with your bladder because there are no Wcs in the rooms. Having sleds, bicycles, deers and saunas inside the garden, the hotel offers various activies and it’s bar was enough to make me fall in love at the first night. Think about a bar made from ice. 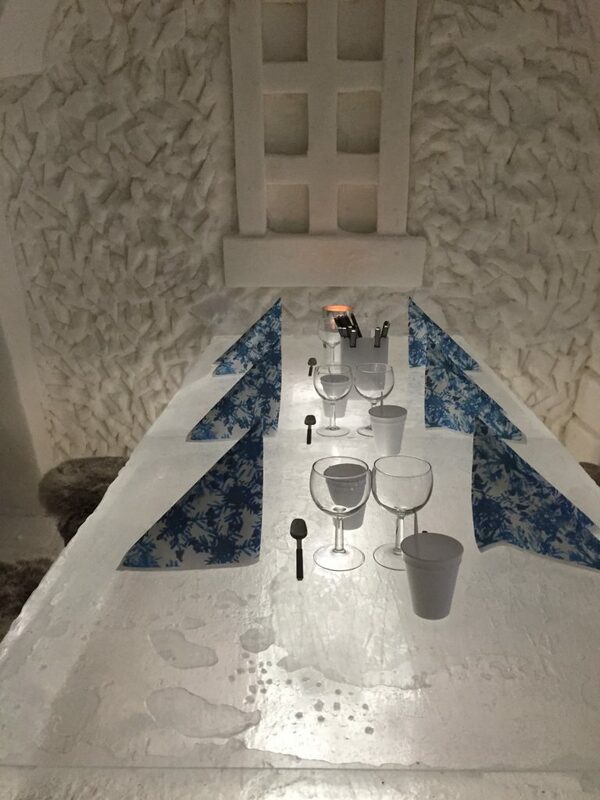 Tables, chairs, shot glasses… Everything made from ice. After we had our drinks we were walking around the restaurant section and while I was looking at how bold was the ice tables are I couldn’t decide what to thing; cold weather or how these ice objects are made? With deers at the door, whole wood Chalet, mountain house, restaurant’s fireplace, wood bowls and spoons made me feel like Heidi. I’m not exaggerating. I suggest you salmon of this place if you come by. About iglos, they look interesting but they’re not so uitable for staying esspecialy if you have children by your side. It becomes light almost at ten in the morning and sunset is at four in the evening. At seven you switch to night mood. There are only six hours to see daylight but it’s exciting and joyful to tell them for six years. Our first stop is Husky Farm. Our guide said first we’ll go out from the hotel and get some clothes but we said no because we almost paid as much as this holiday’s cost to thermal clothes and underwear. Special boats, socks, cap, scarf and overalls were seen exaggerated at first but they said we’d freeze at the first minute if we don’t wear them. We put our clothes to bags and hit the road like Ninja Turtles and arrived to the farm. Even someone who doesn’t like animals can change his/her opinion with the sceen. Hundreds of Alaska and Syberia huskies were barking together. Why? According to our guide they were excited to see us. They invite people to walk around with them. Every single one of them was barking like they were in a choir and move simultaniously. 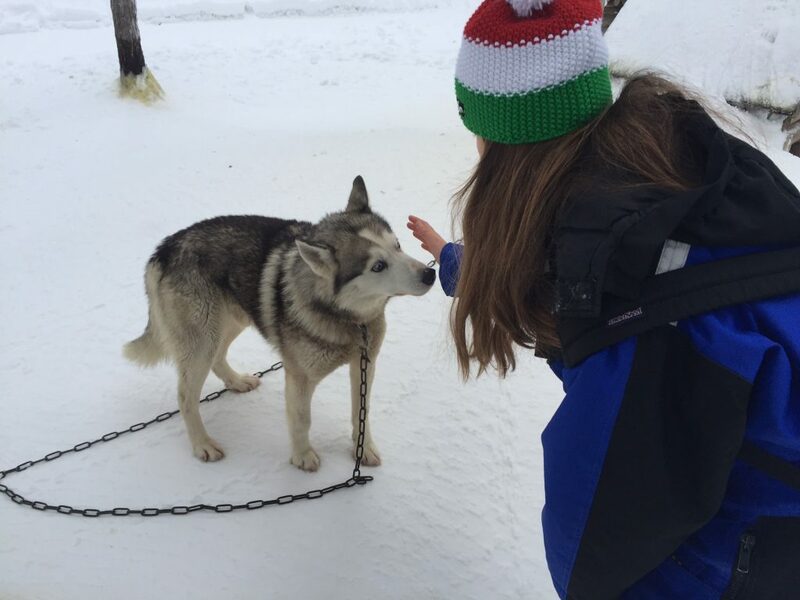 The guide told us how to ride the sleds but I just wanted to pet them. What? Are we going to ride? That was a surprise but luckily there is Erkan with us. He can be a pretty good husky driver while me and Duru are sitting on the front. Here’s our husky safari starts through the forest for nearly five kilometers. You manage the eight dogs sled with using your feet as brakes. They don’t run they’re almost flying. Duru and I clinged to the seats on the front of veichle first but then the sceen changed because of some natural happenings like their fights with eachother, pee and even mating of two. We gave ourselves to the dogs and the road. Sometimes the dogs eat snow and we’ve learned that they eat snow to balance their tempreture. Some times Erkan made us dive into snow masses at the bends and while he was grouching about how the imbalanced sled was going alway to the right side, his phone felt from his pocket suddenly. While we were laughing until our stomachs aches, local guide came and prevented the tour from costing us much more. You may say poor animals but they’re happy. They’re healthy as much as they run. Esspecially in spring time they’re runned three or four days of week so it’s natural for the region. Since the sleds are too fast, glasses are neccessary and in that moment I’ve seen how important is the clothes. One of my hands were bare for five minutes to take photographs and videos and it took almost three hours to get back normal. Huskies don’t get cold, don’t be afraid! Their furs save them and no problem until minus forthy degrees. They become ready when they’re two and the huskies can run this fast until they’re ten. The most powerful ones are at the back with the tightest string, the weakest and the laziest are in the middle. The frontiers are mostly females and males usually follow her. Located near the Husky farm, a Sami guide named Jonas welcomed us at the deer farm. 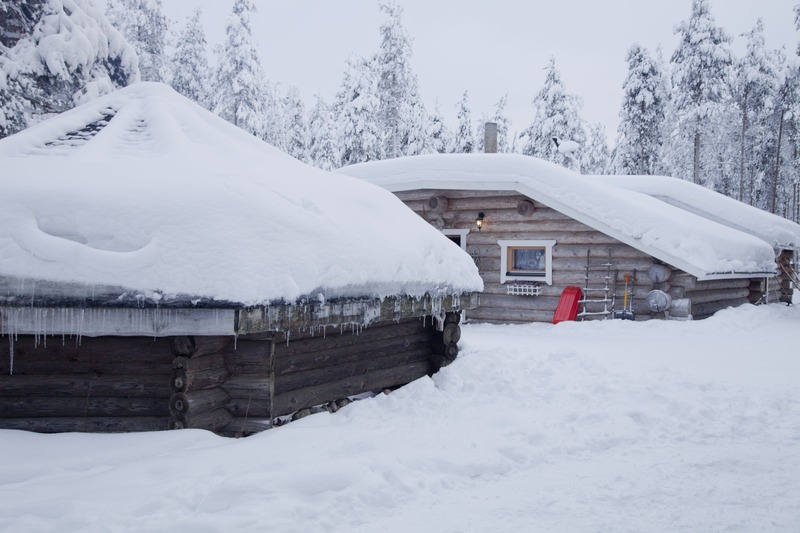 This place is Samis’, local people of Laponia, farm and whole deers are belonged to them. First we drank our ginger tea in a native American like tent, after that we had information about the deers. The info was extremely interesting such as they stand up after half an hour of their birth and the next day, they start to run fast suddenly. The deers of Santa Claus’ sled live in only Finland’s Lapland region. There are 200 thousands of deer in Lapland and 180 thousands of people so deers have bigger population than humans. Even all the deers live freely in nature but they all have their owners and the labels on their ears are used to understand that. Since the deers search for herbs inside the snow with their noses, local people call them Karubu which means snowdrop in their language. Their hornes vary between for kilos to eight and their psychologies extremely hurt when they lose one. Sometimes they cut the horns to prevent the deers from fighting but cutting their horns hurt them. After all the talk, here is the exciting part, meeting with the deers. Like Huskies, we’ll ride the deer sleds and every sled have room for two. That means I’ll ride one all by myself. My deer called Nani is a little bit lazy. At first she didn’t wanted to move but after that she couldn’t refuse my and my beautiful words and she took me to a wonderful to. At the end she didn’t want to leave me and she even try to escape from the fences. While I was riding the deer, at some point horns of the other deer were so close. We were that close as you can understand. I still remember and laugh; the woman in front of me said “Watch out your deer she’s gonna hit me!”. It’s a deer my friend! It was one of the most beautiful moments that I’ve ever lived, riding a deer on the whitest three kilometers road that I’ve ever seen and being so close with those horns. By the way, we got a deer riding licence for five year and it’s valid in whole Europe. We’re in the village of bearded Santa Claus who is known as the symbol of chrismas and called Santa Klaus in most of the European countries. A man from Demre who makes children happy with gifts with his red outfit. I can tell that it’s a fairy tale. A giant pine tree at the gate, after that wooden buildings of restaurant, café and gift shops that decorated with the lights, a string to declare where the Arctic Circle is and the music just like the snow globes play… You feel like you’re in a dreamland made from cottonwool while you walk through the pine forests rather than an European city. 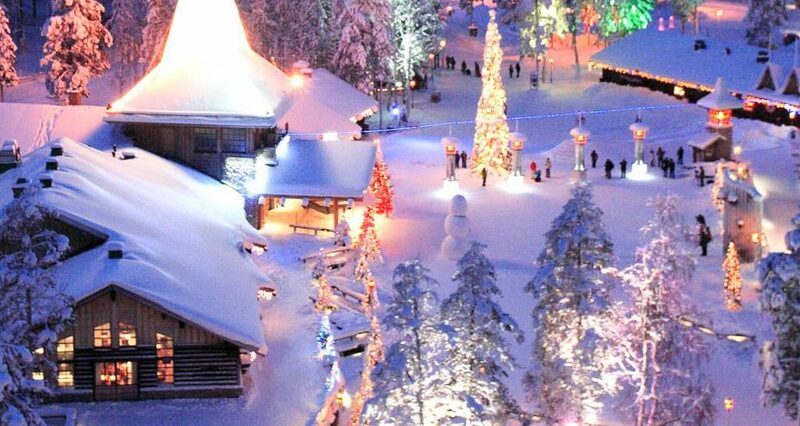 Finland is accepted as the official state of Santa Claus and this village is patented as the place that he lived in. If anybody wants to take a picture with Santa, he says “Ho ho ho!” but that costs 45 Euros. I think it’s now worth it. Besides, Santa Claus post office of the village is more fun if you want to buy interesting cards to write notes and send your loved ones. There are two offers, you may send instantly or in the new year. The country with a 6 millions of population has two millions of saunas. Amazing right? It’s like going to a café to them. Like we dine our guests at the tea tables, they do it in their saunas at home and refusing the sauna invitation is a very bad manner. Women and men enter to saunas together and naked. At the first night, we went to a sauna, located in the garden of Arctic Hotel, to take photographs. We didn’t try but there are interesting activities in the lake under the name of special sauna experience. First you relax at the Finnish hammam and after that you jump in to the freezing lake to alive your circulation system. I wasn’t brave enough to dare this three hours activity. Before I’ve been in Laponia, I was curious about ice hotel concept. I’m sure you’d like to know how a hotel can be made from ice, how can anyone stay in an ice hotel and how much does it cost. 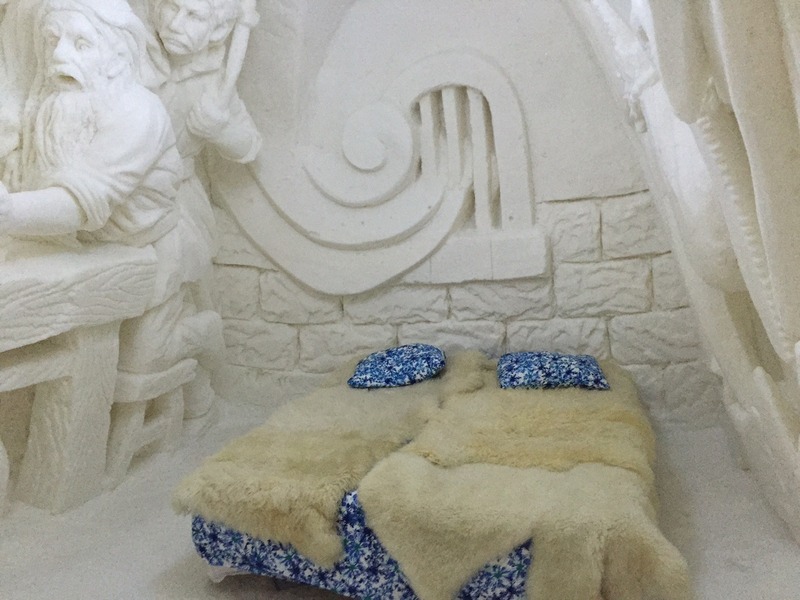 Snow Castle is made in the industrial city of Kemi, 1,5 hours away from Ravaniemi, and the world’s biggest building made from ice is built every winter the hotel melts every summer. Basicly the hotel is snow and ice. Entrance has a long hall and various sized rooms. It’s made every winter since 1996 with different themes again. So, the statues and figures change but chapel, restaurant and hotel don’t. In the bulding which average tempreture is -5°C, every room is full of ice beds and there are deer skin on them. Also, sleeping bags are given to the guests. There are various statues in the rooms’ walls. Everybody asks about toilets and it’s a problem because there are no toilets in the rooms. You have get out of the building. Besides, you can’t have your stuff in the room, you place them into the closed at reception. It’s your decision whether it’s worth 400 Euros or not. We prefered drinking from ice glasses, sitting at the ice tables and sliding down from the castle. 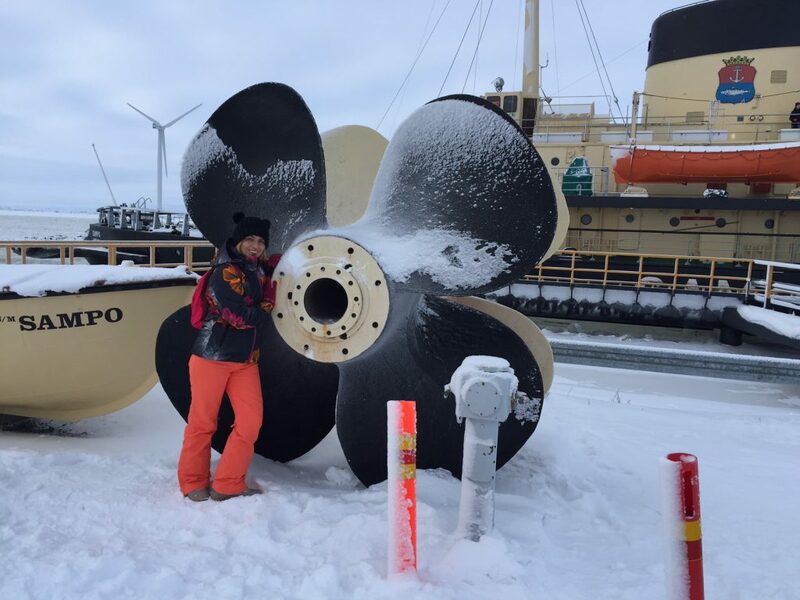 Not partly, completely frozen Arctic Sea, a 1960 made icebreaker ship and you’re on board. Just in a second the ship will move and start to break ice to open a way for the other ships. You’ll see how those ice breake, witness that sound and every section of the ship will be told to you. You’ll see everywhere in the ship from boiler room to captain’s. After that you’ll swim in the Arctic Sea with special clothes. Even thinking about it was so excited before the start. Laponia is located in the northest Finland and there is one person for a kilometer but there are a lot of people in Sampo Icebreaker. We see how many people were curious about this adventure and there were five other Turks except from us. With a guide, first we were informed about the ship and than had the tour in sections. 75 meters height and 3,5 tons mass, this ship was used on it’s original purpose in the old days but now it’s only touristic. At the restauratns of the ship, you may taste Finnish dishes and if you booked a half day tour you’ll have a soup with no cost. We booked our tickets before we arrived Laponia from www.visitkemi.fi. The tour startet at 14:00 and ended at 18:00. The most unforgettible part of it was the swimming. Think about it, the ship reached a little water and you swim in it. For this, you must wear a latex like plastic clothe. Only your thermal underwear and socks stays. You wear the overall, your hands and feet are in it and then you’re in the water on your back. It was one of the most interesting experiences that I’ve ever had. There is an important point, you must be at least 145cm tall to swim. Under that height, the clothes don’t fit and they don’t let you swim. Me and Duru Kınay had a lot of fun because people can’t move much in those clothes and at some point you coincide a Chinese had right next to you. Or, your foot might hit some other people’s head. It’s not a cheap tour, so the tours that travel to Laponia don’t contain this event. 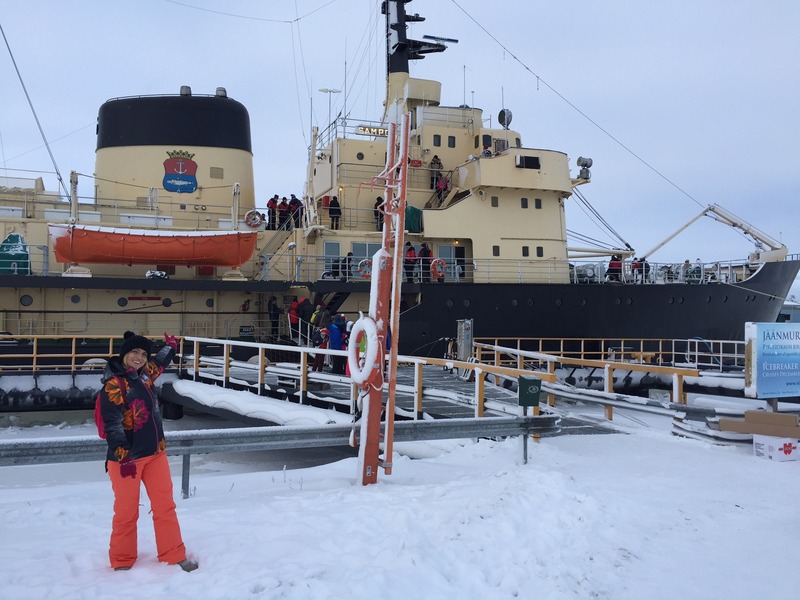 But Sampo Icebreaker experience must be the most important activity to do in Laponia. We saw a little of nortern lights when we get off from the ship, Sampo. Actually it was one of the main goals of this trip but we weren’t lucky for four days and we couldn’t see the fusion of pink and green in the sky. 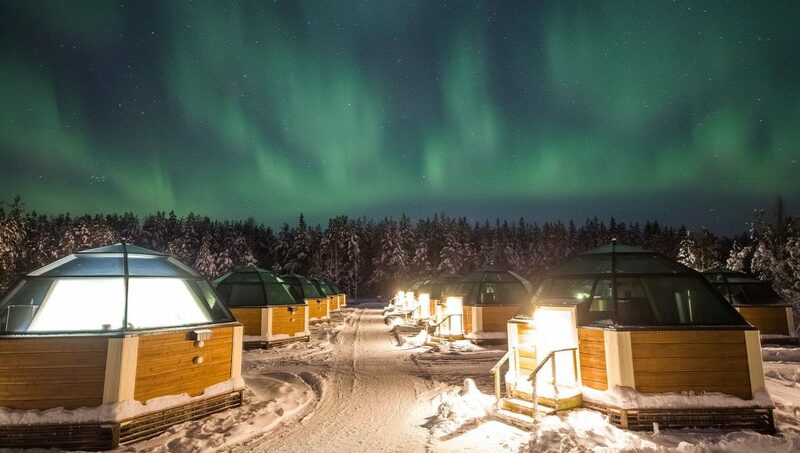 Seeing the northern lights that appears in Laponia for eight months of year depends on luck. Some see at the first time and some can’t even at the fifth time. During the explosions in the sun, some particules full of electricity can escape from gravity of the sun and when they clash with the atmosphere, those sceens that appear are the norther lights. They’re generally green, sometimes pink and other colors. At the last night, Sky Hotel which we went to see the northern lights is an romantic place besides to see the lights. Located in pine forests and ten minutes by car from downtown, this place is ideal for the ones who seek silence. Looking over Rovaniemi, sipping your coffee at the terrace with the northern lights might add ten more years to your life. The restaurant is esspecially famous. Tasting menu is suggested. Having the most people who take books from library, the best education system of the world and least problematic state according to World Peace Foundation, Finland tricks my heart and Laponia region witnessed the best moments of my life this winter. If you seek alternative places for holiday, like nature esspecially animals, look for adventure and don’t afraid from cold, I suggest you Laponia. For the ones who think about travelling with children, my advice is after six years old, when your child can adapt to a different culinary, natural and weather conditions you should choose this trip. We attended this tour with Gazella Tur. We were taken from home and given lift in the end and our special guides were open to contact made us relax and entertain easily for four days. As a travelling family, mostly we prefer travel alone but in this experience we say we did a good thing with having this experience with a well experienced tour crew. 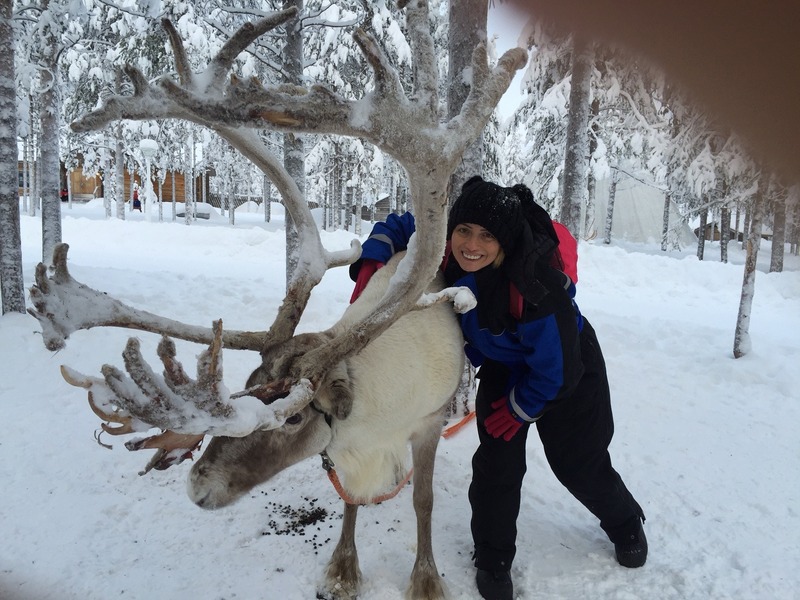 To read tips like what to eat and where to stay in Laponia, what should you take with you and must-sees of Rovaniemi wait my other article.